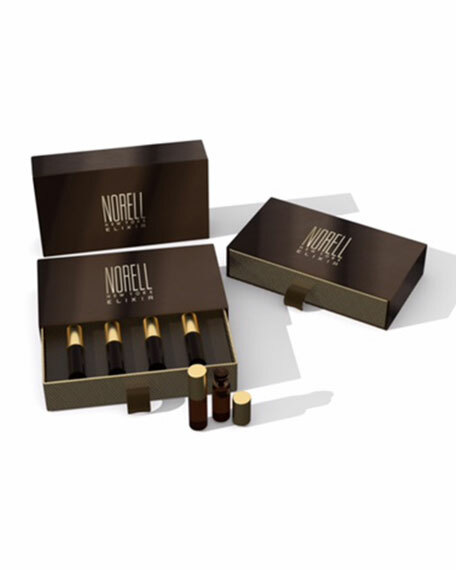 Norell Elixir is an addictive and sensuous fragrance. An essence that seduces the senses with an enticing blend of cool spice, intoxicating white flowers and a narcotic trail of dark woods and sweet sensuality. WHITE FLORAL ACCORD  A romantic display of pure, sweet white flowers. PATCHOULI CASHMERAN  A rich, oriental blend of minty spices and smooth woodsy musk. CITRUS WATER  A refreshing mix of orange, mandarin and zesty grapefruit. MUSK TOBACCO  A mellow woody scent with a hint of jasmine for a warm feminine touch. Four beautiful accords that can be worn each alone, together, or to enhance NORELL ELIXIR.